MEF-CECP is a mark of excellence that stands alone. Ensure your certification remains valid as the market for Carrier Ethernet services accelerates, driven by the need for service speed, performance, assurance and the transition from static to on-demand services. MEF, supported by a worldwide community of Carrier Ethernet Certified Professionals (MEF-CECPs), is the global driver behind the continuing acceleration of the Carrier Ethernet services market. As CE services continue to evolve, MEF-CECP professionals are required to maintain active certifications in order to keep pace with a market that is being driven by a need for service speed, performance, assurance and the transition from static to on-demand services. With the recent launch of MEF 3.0, this requirement has never been greater. Given the rate of industry change, MEF-CECP professionals need to keep pace with MEF developments, as they happen. Case in point is MEF 3.0, launched in 2018 as a global services framework for defining, delivering, and certifying assured services across a global ecosystem of automated networks. New testing and monitoring, and service assurance techniques that are a must to build assured MEF 3.0 networks. Maintain a trained and well-versed employee pool of certified professionals that can serve their customer base with a proven mastery of CE services. When and how does the MEF-CECP certification Expire? MEF-CECP certifications are “Active" for a period of 3 years. 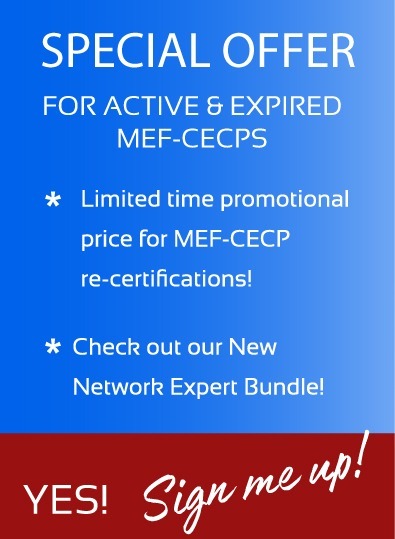 To maintain an ‘Active’ status, MEF-CECPs need to take a re-certification exam before the expiration date of their current certification. Those who maintain a status of "Active" continue to hold their uniquely certificate ID. Those who do not re-certify before their certification expiration date will lose their certificate ID, and the status of their certification will change to "Inactive" (expired) on the Certified Professionals listing. Not necessarily! And this will depend on the age of the expired certification. An individual that originally certified 6 years ago will most likely need more training than one that certified 3 years prior. The good news is that many of the MEF Accredited Training Providers (MEF-ATPs) offer special "delta" a or "top-up" training courses focused on providing updates to the baseline knowledge that existing MEF-CECPs should already know. If you are, and continue to be current with MEF technical works, then you should consider taking the latest test, having reviewed the latest exam blueprint prior to the exam. What Is My Current Certification Status? The status of your certification is listed on the MEF Certified Professional Certification registry and a monthly email reminder is sent to each MEF Certified Professional six months in advance of certificate expiration. The cost to re-certify is $300 $175 (click here for the promotion details). To register for your re-certification exam click here. For a detailed overview of the MEF-CECP exam click here.